Another day on the trail! 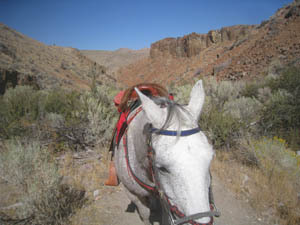 This time it was the 30 mile ride through Sinker Creek Canyon. And it was on 18-year-old Quickie. Quickie is not too excited about anything but eating any more, but, since she didn't want to get pregnant this summer, she went back to work. (I bet now she was rethinking spurning the advances of that gorgeous Cremello stallion, LJ Owyhee Moonstone next door.) Today Quickie and I escorted Suri on his first 25 mile ride with Connie aboard. Now, while ride manager Steph Teeter did rake miles and miles, and miles, of trails (did anybody notice? ), Sinker Creek was R-O-C-K-Y. Pure rock, in fact. Which you pretty much had to take at walking speed, which was a good thing, because it was so scenic. 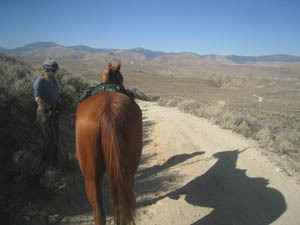 Two-track roads and cross-desert trails over BLM land led us to where the out-vet check would be at about 5 miles from camp. We stopped for a good drink and leisurely munch of hay that was already set out, and as we continued on over the flats toward Sinker Creek, the first 50-milers (who'd started an hour before the LD) were already cantering back towards us and the vet check from their 20 mile loop through Sinker Canyon. 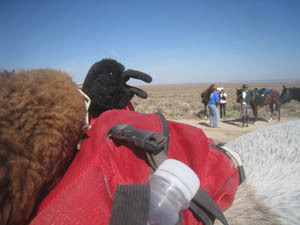 We moseyed our way to Sinker - it was an educational day for Suri - and when we got to the top of the hill leading down, Quickie stopped. I couldn't get her to move again - she was waiting for me to get off and lead her down. So I did. Sinker Canyon was just getting its first whiff of fall, the cottonwoods and willows just starting to turn with a little color. 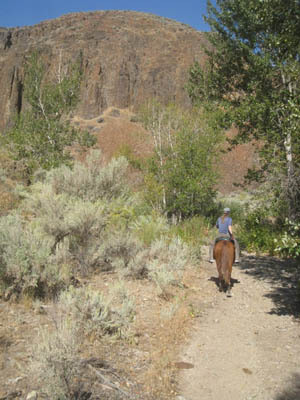 Our rocky trail wound back and forth through the flowing creek, through tunnels of overgrown willows, some that we had to duck under; and the tall red cliff walls kept us in the shade and cool air. Halfway through the canyon we passed some ruins of an old cabin, and a little further on we came across some cattle. Cattle aren't normally scary, but when they start making rustling noises in the brush behind you, and then you start hearing non-cow hooves on rocks, and splashes, and then human voices where they shouldn't be, things in the overgrown canyon do become rather spooky. And it wasn't Suri, the green horse who spooked while leading in front, but the old hand Quickie following behind who was scared. It could have been a cougar back there, after all... Quickie wanted to take the lead and get the heck out of the canyon. So Suri let the old lady move to the front, and he protected her from cougar attacks from behind, and we made our way along the creek-bed out of the canyon, following an old road carved into the shale cliffside up onto the flats. John Teeter riding an ATV followed behind the last riders (just behind us) closing some of the gates we'd passed through, and he noticed a mysterious pool of blood beside one of them. A rather substantial pool... but no sign of humans or horses in distress, no tangled gates or wires, no torn up or scuffed ground... just a mystery. No complaining by anybody back at camp later in the day, either. Coming into the vet check, the riders behind us caught up with us, and then the heated race for Turtle was on. Who could go slowest? The vet check crew was about ready to pack up and leave by the time we got there, and in fact they did pack up during our 50 minute hold, and they followed us down the road toward home with all the gear when we left. We leisurely made our way along the 5 miles back to camp along the wash we went out on this morning, and even with me getting off Quickie to walk her in the last mile-and-a-half over the hard-packed road, I was still only 5th from last. Well, Quickie would have been quite insulted by the Turtle award! Back at basecamp after the ride, I finally met Tamara of In the Night Farm, having just arrived with her horse Aaruba for tomorrow's 50 mile ride - their second 50 after a horrific near-fatal colic by Aaruba last October. Tamara and I had been following each other's blogs for a while, and in fact were both at the Old Selam ride in August, but just hadn't met yet. Then there was my Nevada endurance riding pal, Krysta, who'd come from Reno with her mom and one horse, and room for two in the trailer - she was coming to look at DIEGO! My sweet stinker Diego - actually Kevin in Arizona's horse, but Diego loves me bestest and mostest - might be getting a new owner! And nobody better than Krysta, whose main horse Sinatra has been diagnosed with cancer : ( . It was good to see Krysta again, and if Diego must leave, I'd be happy to see him hop in Krysta's van. I think they are a match made in heaven. All 29 horses finished the 30 mile ride, and 22 of 24 finished the 50 mile ride. 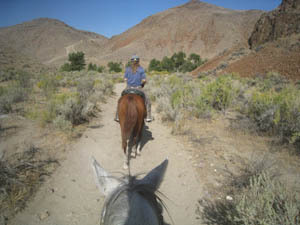 One of the pulls was neighbor Carol on our riding buddy August. He stepped on a rock just wrong - after the rocky canyon, not in it - and ended up with a big stone bruise. This was the first time Steph recalls there being more entries in the LD than the 50 mile ride. In fact, some people came to the Canyonlands just to ride in all the LDs... and this was the first time Steph offered 5 days of the shorter distance. 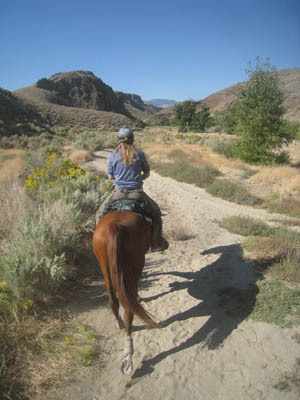 For many LD riders it was a stress relief - you didn't have to worry about trying to get your horse through 5 days of 50's. 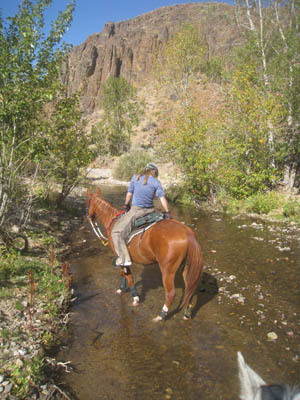 You're out on the trail for 3 to 4 hours, and then you have the rest of the day to relax and visit, and enjoy the Owyhee Scenic Spa at the Teeter Rancho.